(Bloomberg) -- Fresh off reports that it’s exploring a venture with PSA Group to build cars in Europe, the chairman of Fiat Chrysler Automobiles said the automaker will remain an active player in helping to shape an automotive industry being transformed by technology. 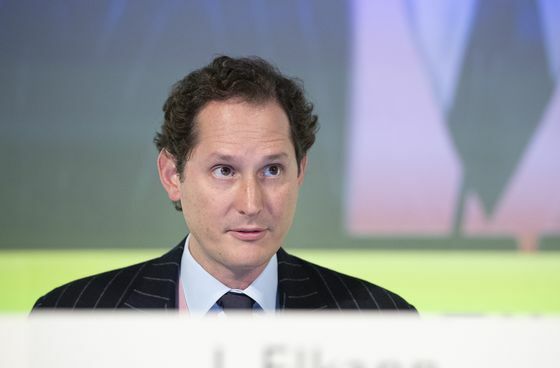 John Elkann, the chairman and chief executive officer of Exor NV, wrote in a letter to shareholders of the holding company about his belief Fiat Chrysler can benefit from the emergence of electrified and autonomously driven vehicles. Exor, with a 29 percent stake and 42 percent of voting rights, is the Italian-American carmaker’s largest holder. The Fiat chairman, scion of the carmaker’s founding Agnelli family, has repeatedly sought in recent years to tamp down speculation that Exor would seek to sell all or part of Fiat Chrysler to another automaker. But the family also has said it would consider diluting its stake in a larger group the carmaker could form with other companies. Fiat Chrysler and Peugeot owner PSA have been holding preliminary discussions to collaborate on a “super platform” -- the basic underpinning of a car model -- to reduce their investment costs in the highly competitive European region, Bloomberg News reported last week. Any eventual partnership will likely include sharing investments for new electric cars, according to people familiar with the talks. Carmakers are increasingly joining forces to share investments as the auto industry is facing technological disruption from the rise of fully-electric and increasingly self-driving cars. Stricter emission rules imposed by European regulators are also forcing the industry to shift away from traditional combustion engines. Elkann, in Turin on Tuesday to inaugurate Fiat’s car museum, reiterated plans to produce the battery-powered Fiat 500 at the company’s Mirafiori factory there. During the first 20 years of the industry, some 47 automaking plants were founded in the city, he said. “That courageous and visionary spirit continues to guide us and allows us to face this new period of change with enthusiasm,” the 43-year-old Fiat chairman said at the event. Fiat Chrysler has been a laggard compared with global rivals when it comes to investing in electrification, though its five-year strategy plan through 2022 calls for offering hybrid gas-electric engines in more of its top-selling Jeep and Ram models, and for making fully electric versions of some Fiat, Jeep and Maserati vehicles. The automaker ranked dead last among 13 car companies for both fuel economy and carbon emissions in the U.S. Environmental Protection Agency’s evaluation of 2016 model year vehicles. The company also paid a $77 million civil penalty after its U.S.-assembled passenger-car fleet fell short of required fuel economy targets. It has also taken a penny-pinching approach on driverless cars, choosing to supply Chrysler Pacifica hybrid minivans to -- and potentially license self-driving technology from -- Waymo, the self-driving unit of Google parent Alphabet Inc., rather than follow other automakers investing billions to develop the know-how in-house. Fiat is also partnering with BMW AG and auto supplier Aptiv Plc to bring autonomous features to its Jeep, Ram, Maserati and Alfa Romeo brands. A partnership with PSA could eventually develop into a wider combination in the future, though the current focus is on limited cooperation, according to two of the people familiar with the companies’ talks. Fiat shares were up 1.3 percent to 13.77 euros at 2:34 p.m. in Milan.